The average debt per UK household is around £7,000, excluding mortgages1. Politicians want us to believe this is due to irresponsible spendthrifts abusing easy credit, but according to recent research at least one in five people in Britain resorts to debt to cover basic living costs2. Of course, some people do use credit to fund "greedy" lifestyles, but overall spiralling debt has more to do with Britain's low-wage culture and high poverty level. The government doesn't want you to think about this, with politically sensitive issues such as student loans in the news. Spending on credit has increased by 76% since 19983. Part of this increase is due to highly seductive, but often misleading, credit card advertising. 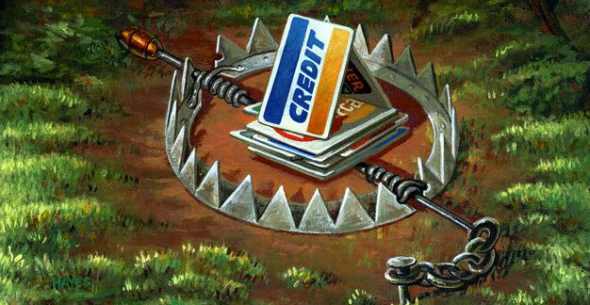 According to the Office of Fair Trading, one in five credit card ads breaks the law  usually involving misleading information on interest charges4. While banks and credit companies make record profits from criminally misleading promotions, they're quick to lecture us on "responsibility". Their PR dovetails with that of lying politicians, painting a picture of an economy compromised only by feckless consumers who exploit and abuse the system. In other words, the problem is you, not them. The only worthwhile advice applicable to all cases of personal debt is: lose your naivety concerning the role of debt in the economic system. You'll then be less likely to succumb to the stigma and humiliation of financial "failure"  you'll be less easily pushed around. Consider yourself naive if you think you live in a free market. Unless the government fails to read its own reports, it already knows the truth: that one in five UK households lives on a poverty-level income5. Wages at the lower end of the market are less now, in real terms, than in the 1970s. This seems to contradict the media image of contemporary Britain as full of affluent yuppies  until you realise the media image reflects how credit enables us to appear affluent even in hardship. Debt is disguised poverty. As usual, with ominous social problems, the authorities blame anything but the system. First they blame consumer irresponsibility, then they blame consumers' financial illiteracy. The solution, we're told, is educating people to handle their finances more responsibly. But this simply diverts from the real problem: a finance-capital system masquerading as a "free market", whose primary function is to benefit the rich, while putting everyone else in debt. The identification of capitalism with "free enterprise" is about as accurate as identifying a sweatshop with a stroll in the park. A real "free market" would allow alternative currencies. The existing capitalist system does not  the legally enforced money-issuing monopoly (eg Bank of England or Federal Reserve) keeps interest at an artificially high level. This is central to the personal debt problem, because if competition were allowed in the distribution of alternative currencies, the cost of credit would fall to the level needed only to administer it (well below 1%). The high level of interest we pay is a monopoly-charge  a forced "tribute" to usurers  it has nothing to do with a free market. Debt functions as a social control mechanism, making us anything but "free". You can't afford to be choosy about jobs if you're in debt. The people who run the economy see this as a good thing. US Federal Reserve chair, Alan Greenspan, was reported as saying that insecure workers are good for the economy, as they keep inflation low (by being too scared to risk asking for wage increases)6. Do you ever get the feeling you're being ripped off? You're not paranoid  you really are being ripped off. The free-market bible, Adam Smith's Wealth of Nations, warned that whenever merchants meet they tend to conspire against the general public. It also warned that monopolies distort the market so that it's no longer free. This is Adam Smith, not Marx  worth remembering whenever defenders of the existing system try to pigeonhole its critics as communists. It's no coincidence that record bank profits are announced at the same time as record household debt. Personal debt isn't just big business  it's central to the system; it maintains the status quo, the monopolisation of wealth by a small minority. Given this structural role of debt, it's remarkable that anyone would feel like a failure for going into debt  or feel irresponsible for walking away from a debt. But such is the insidious power of corporate propaganda. 1 Bank of England, Quarterly Bulletin, Autumn 2003; 2 KPMG survey, quoted by Press Association, 2/9/03; 3 Evening News, Edinburgh, 17/3/04; 4 Ibid; 5 Joseph Rowntree Foundation report, December 2003 (2001/2002 figures); 6 US Congressional testimony, 26/2/1997.